VICKI VAN HOUT’S CHOREOGRAPHY IS SOME OF THE MOST IDIOSYNCRATIC AND INVENTIVE SEEN IN AUSTRALIAN DANCE FOR A LONG TIME AND HER TEAM OF DEXTROUS DANCERS EXECUTE IT WITH HIGH PRECISION, UNBELIEVABLE ENERGY, HUMOUR AND ATTITUDE. VAN HOUT HAS BEEN A BUSY DANCER, CHOREOGRAPHER AND RESEARCHER TRAVELLING EXTENSIVELY TO INVESTIGATE INDIGENOUS DANCE. SHE HAS A COUPLE OF SUBSTANTIAL WORKS BEHIND HER, HOWEVER IT’S A NEW CREATION, BRIWYANT (FOR ‘BRILLIANT’), THAT COULD BRING HER THE ATTENTION SHE WARRANTS THANKS IN PART TO A SHORT BUT SIGNIFICANT PERFORMANCE SPACE SEASON. In Briwyant, Van Hout pays similar if much richer and more elaborate attention to the integration of dance with design. Scarves, for example, are transformatively shaped to suggest digging, cradling and the binding of one person to another. Hundreds of playing cards are arranged across the performing space evoking a riverscape. These are deployed, quite laterally, like the dots of the Indigenous paintings that fascinate the choreographer with their shimmering brilliance. On the Performance Space website, Van Hout writes, “Cards/ As the repetition of a dot/ Layed down as a river/ As a deck to share the wealth/ Made from?Dots on a canvas/ When sung/?Signify ancient power/ To transport us to the dreaming/?The everywhen.” She explains, “Briwyant is inspired by bir’yun: brilliance, shimmer and shine. In Yolngu traditional painting, bir’yun is the effect of intricate crosshatched patterns creating a sensation of shimmering movement over the painting’s surface, a manifestation of ancestral forces.” Briwyant conveys an engrossingly similar phenomenon when a dark upstage rectangle disappears the dancers but then bathes them in sparkling light. 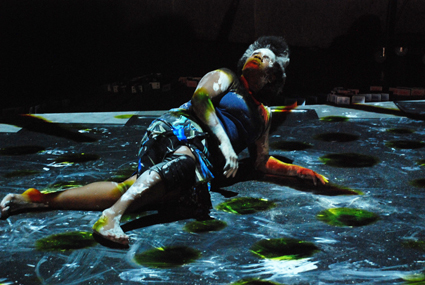 The choreographer’s sources are many, drawing on and effectively melding diverse Indigenous and other forms within a dance theatre framework that ranges from droll rhyming verse (delivered by the charismatic Van Hout herself) to a lucid dreamtime tale transformed into dance, to witty social encounters and sometimes mysterious but never less than intriguing images pertaining to Indigenous art and culture. Soundtrack, media and lighting are occasionally burdened with superfluities, but the best of Marian Abboud and Imogen Cranna’s digital media effects, Elias Constantopedos’ score and Guy Harding’s lighting fuse seamlessly with Van Hout’s organic exploration of the relationship between bodies and the lines, dots and the hatched ‘shimmer’ of Indigenous art. Danced organically across Van Hout’s playing card landscape design, this makes for a powerful experience, at once magically elusive and cohesive. Dancers Henrietta Baird, Ian RT Colless, Ghenoa Gela, Raghav Handa and Melinda Tyquin are superb. See also an interview with Vicki Van Hout.